King Leonidas in God of War: Ascension? Ever since the film 300 hit theaters, people probably thought of how they would look in King Leonidas’s armor. While some of us haven’t had the pleasure to don said armor, Ascension at least allows your character to look just like him. The DLC comes as a GameStop exclusive pre-order bonus and can gained through the pre-order of either the standard or Collector’s Edition. 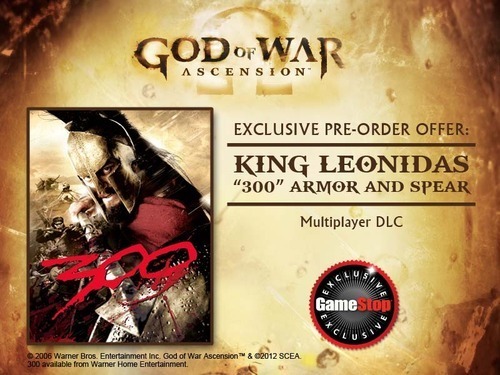 Once pre-ordered, gamers will receive the code to redeem Leonidas’s armor and spear. A 22 inch by 28 inch double sided God of War: Ascension poster will also be given to GameStop customers who pre-order. Ascension is expected to launch into stores on March 12, 2013.